"I don't falsify elections and I don't spread propaganda. But I'm still a teacher, I exist"
Teachers at a May Day demonstration in St Petersburg. Photo (c) “Teacher” Inter-regional trade union of education workers. All rights reserved.While some teachers in Russia are involved in falsifying election results and excusing corruption, others picket government agencies, get together to form independent trade unions and tell their pupils about how to behave when they are arrested. Since the 26 March protests, teachers and admin staff at some Russian schools and universities have started running awareness-raising sessions with their students. Mostly they tell them about the opposition rallies (funded, naturally, by the west) and the danger facing Russia from the US State Department, although sometimes they also harass students who dare to disagree with them. Videos appear regularly on social media, showing teachers trying to convince their school or university students that Russia’s endemic corruption is perfectly normal and that they should respect their country’s rulers. The Ministry of Education and Science claims that teachers hold these pseudo-patriotic chats on their own initiative, without any orders from above. The result of these political education lessons is that teachers as a group have, not surprisingly, come under fire from the public, accused of “servility and amorality” – despite the fact that many of them have been at opposition rallies themselves. As part of our project devoted to education in the post-Soviet space, I talked to educators and members of the independent “Teacher” trade union. They have told us how to resist pressure from the Ministry and the law enforcement agencies, where to draw the line between discussion and advocacy in the classroom and how to build a dialogue with students. 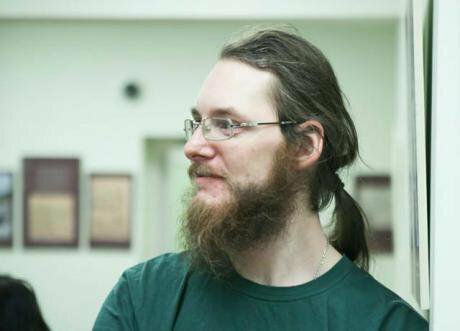 Andrey Rudoy: “By the time I started work as a schoolteacher, I was already a political activist.” Photo courtesy of the author.None of our students made it to the 26 March protest – it involved an awkward journey to Nizhny Novgorod, 30 kilometres away. It was mainly school kids and teachers from regional capitals that took part in the rallies. I think our students would have gone if they hadn’t lived so far away. Our young people are involved in this movement: former students, young people in their final year and some in lower years are all actively engaged in the issues and support opposition initiatives. Of course there’s nothing organised about it yet; for these teenagers, it’s still a spontaneous protest. I often hear students talking about it during breaks, and they were asking me if had been I there. In class you can sometimes hear comments about repressive measures taken against school students across the country. For example, there’s been a lot of discussion about the Bryansk school student who was arrested right in his classroom for supporting opposition leader Aleksey Navalny, among other instances. But as they haven’t been at any protest rallies, there haven’t been any orders from above. At least, not yet. If that were to happen, and somebody tried to brainwash them – which can happen very quickly – they’d react pretty strongly. Schools are very wary of publicity and scandals; if anything got into the media it would produce a real bombshell. I have a good idea of what happens when both the Ministry and the cops decide to intervene in schools. When I first came to this school I was active in politics – it was in 2012, at the time of the Bolotnaya protests, and the country was in turmoil. I was the local coordinator of Left Front, a fairly radical group by usual opposition standards. There was a terrible uproar, all the way from the school management to the city authorities. The FSB, the public prosecutor’s people and the police were frequent visitors to the school and there were a lot of very heavy conversations. The school’s headteacher told me to remove all my students’ names from my VKontakte social media page and never to discuss politics with them. Someone, supposedly a parent, wrote an anonymous denunciation, saying I was an extremist and couldn’t teach children. It obviously came from the FSB, but teachers can’t be dismissed unless they have broken a law, and I hadn’t been formally accused of anything. 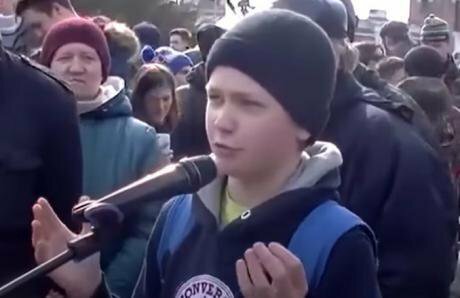 26 March: during a protest in Tomsk, fifth grader Gleb Tokmakov openly proposed reforms to Russia’s political system. Image still via YouTube / Sergey Stepanyan. Some rights reserved.After a wave of protest, the cops backed down. Then they decided to try another tack. As I had organised an independent trade union in the school, the headteacher tried to put pressure on us and wrote a statement to the police, claiming that I was circulating inappropriate material among the teaching staff. But they couldn’t even make an administrative case out of it and that was that – the school community was on my side. In the history and social studies syllabus that I now teach, there is a module on political parties in Russia today. This of course sparks lively discussion; my students are all politically aware. They’re subscribers to various political VKontakte groups, so can articulate their case a lot more effectively than their parents because, unlike the older generation, they don’t watch Dmitry Kiselev, the government’s chief TV propagandist. After all, there’s nothing scandalous about young people trying to air their political opinions; it’s their constitutional right. Teachers’ arguments about the dangers of going to protest rallies are just attempts to excuse their own political apathy. 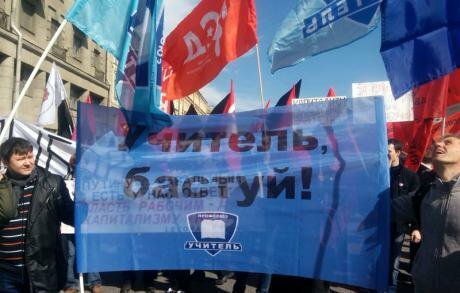 I haven’t taken part in any recent rallies, because I consider them futile, as do my colleagues in Dzerzhinsk. I think they are disorganised and lack a coherent plan of action. What have we got out of them? Two thousand people gathered in Nizhny Novgorod – a very large turnout for a place like that. They marched past the city’s castle, but that was it. I think it would have been useful to hold a general strike as well. The teachers at school sometimes talk about the recent protests, but there’s no lively discussion. Nonetheless many people share our views, despite the omnipresent propaganda. From the outside it sometimes looks as though many of the teachers are pretty apathetic, and that’s true to some extent. But at the same time there are an increasing number of people who are not afraid to defend their rights and interests – colleagues of mine, for example, who have joined the union or are close to it. Alexei Makarov: “propaganda in the form of patriotic education simply doesn’t work.” Photo courtesy of the author.Conversations about how school students shouldn’t be allowed to take part in protests reflect a common view that young people under 18 have neither rights nor opinions. This matches the government’s conviction that they must have been put up to it by someone else – as though they can’t read or write themselves. Students from our school went on protest rallies, but everybody is different. Some went because they thought it might be fun – a kind of amusing spring activity; others took part in protests because they are politically conscious and support opposition initiatives. My colleagues and I have been discussing these last protests a lot, thinking about what and how to teach our students; which of their questions we should answer in class and which outside; how openly and directly we should tell them about what is going on and how to associate with students who show an interest in activism. Some teachers feel that the students are still too young for demos, others believe that the most important thing is to make them aware of the legal situation, to keep them safe, and then let them decide whether to demonstrate or not. In general, most of the teachers in my school have what you’d call liberal views. Students start learning about the law in eighth grade (aged 15-16). They find out how to behave around the police and what to do if they are arrested. We don’t, of course tell them that an illegal protest is going to take place on the such-and-such date. But we don’t need to: they find out and decide for themselves. We cover a variety of topics in our social sciences course. For example, when we talk about how our government works, we analyse why members of the public go on protest demos and how they can express their views. There are many possible motives, and it’s important for kids to know that. Young people can come to understand a lot, but it’s another matter when they go through these things themselves. Personal experience counts for so much more. 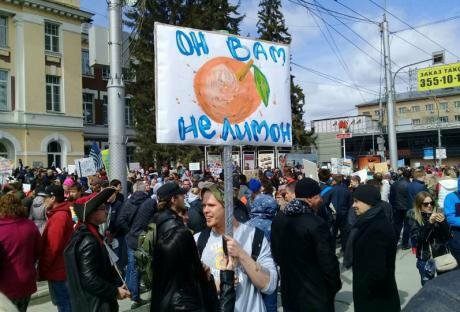 “He’s not ‘lemon’ to you, reads this placard from the “Monstratsiya” demonstration in Novosibirsk (in a play on words on Navalny’s recent film about Dmitry Medvedev’s corruption). Photo courtesy of Taiga.info. Some rights reserved.But until and unless young people find out how political movements and actions can have an effect, they don’t see any point in them. They realise that “something is rotten in the state of Denmark”, but have no idea what to do about it. Some of them feel frustrated and plan to emigrate. Others, who remember our successful fight [when parents protested against a proposed school merger - ed.] a few years ago, know that it’s possible to change things. As for these videos of teachers hectoring and condescending their students, I think they are more typical of regional schools and usually a personal initiative on the teachers’ part. Frankly, I’m embarrassed by my colleagues who talk to students like that, regardless of the specific topic. If I ever spoke to my students like that, even if I told them that Putin was bad and Navalny good, I would have to leave the profession. And I’d understand why. Party politics should be kept out of schools, in the sense that we shouldn’t set up junior party cells and campaign for this or that candidate. But that doesn’t mean that politics can’t be discussed in the classroom. Discussion is one of the key elements of a social sciences class: being able to formulate one’s thoughts and find allusions and arguments is an important skill. In videos we can see children sensibly, logically and intelligently discussing current events and arguing their points clearly. The recent protests may inspire the government to add political education and patriotism to the school timetable, but for the moment they are just platitudes. We’ll find out in September whether anything will happen. Usually, at the start of the school year, the ministry of education sends recommendations to schools about how to present the chosen topic for the annual lesson in patriotism that a school may provide. There is no obligation, but the school management always wonders what will happen if the recommendations are not followed. Many schools report on how they conduct these lessons, but in fact they could spend the time more productively. Three years ago, the topic was Crimea; six years ago it was the Beslan tragedy. This year the subject might be protest rallies. Our school doesn’t bother with these lessons. The ministry might also send letters to headteachers asking them to “explain” one thing or another. There have been times when Moscow schools’ heads were summoned to the investigative committee for a chat. And now the government might think, “We’ve got a new problem with these protesting youngsters: let’s discover where they hang out and nip it in the bud”. 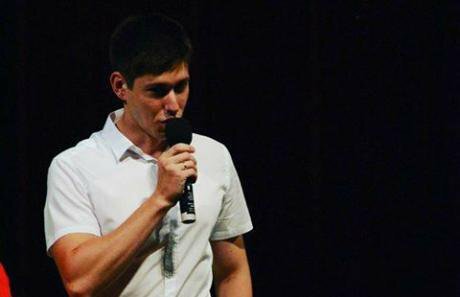 31 March: a student disrupts governor Nikolai Merkushkin's speech at an "anti-extremism" forum in Samara. Source: Youtube. So it’s natural that schools are under pressure from the Ministry. But if a student is having some problems over his or her activism, a good headteacher will write them a good reference and warn them that questions have been asked about them. You also need to understand that propaganda in the form of these lessons in patriotism just doesn’t work. Young people are generally apolitical: they’re sick of the official ideology and how it’s presented to them. I can predict that if lessons in patriotism are made compulsory, they’ll have no impact, because the school kids just won’t play along. And any teacher who sets him or herself up as a mentor and a person who knows how everything plays out is also not the best approach. I believe that if teachers are putting pressure on a student, he or she has the right to stand up for their rights. They should complain to the headteacher that there are things happening in class that have nothing to do with the subject they’re supposed to be studying. If students are facing more serious repercussions, I would suggest they get in touch with the Public Verdict Foundation, which runs a support programme for young people who are having problems because of their civil activism. If, on the other hand, it’s a member of staff who is facing official harassment, I haven’t heard of anyone losing their job, apart from one teacher in Krasnoyarsk who was fired for showing Aleksey Navalny’s film “Don’t Call him ‘Dimon’”, where he accuses prime minister Dmitry Medvedev of involvement in corruption on a massive scale. But unfortunately, we’re unlikely to hear these things unless they are happening to people we know. In such cases, teachers are usually “persuaded” to write letters saying that they are leaving “of their volition”. So we don’t know whether he was just fed up, or was forced out by the school head because several students in his class had been arrested during protests. A week after the 26 March protests, I wrote a post on Facebook saying that “I don’t falsify election results, don’t feed my students propaganda and don’t have it in for LGBT kids. But I am still a teacher. There are teachers like me”. My post went viral: other people wanted to echo my feelings. Sometimes teachers like us feel we are living on the margins of our profession, and everyone else is crushed by our society’s values. But that’s not completely true. The problem is that even our best fellow citizens are used to putting people into boxes. Everyone knows the term “public sector worker”, and mostly see them not as people who are doing important and complex work in pretty difficult circumstances and are directly involved with that same public, but as functionaries controlled by the state, and accordingly treat them with contempt. The government does, of course, want to control them, but everyone is different. And that includes teachers. However much you tell people that you personally haven’t gone to officially organised pro-government rallies, nobody will take any notice. 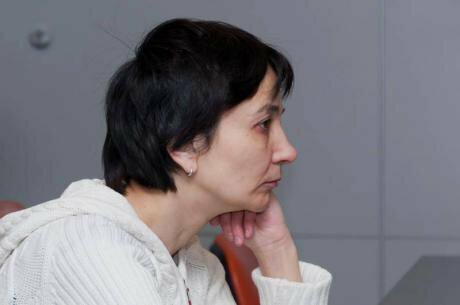 Olga Miryasova: “Even if a teacher supports the opposition, she shouldn’t speak about it openly.” Photo courtesy of the author.These days, a lot of people like to tar everyone with the same brush. When well known journalist and political commentator Sergey Parkhomenko called teachers a pathetic, unprincipled community, his comment became a self-fulfilling prophecy. It’s very common, of course, for good teachers to leave the profession, and the problem of negative selection is more relevant than ever: low salaries, long hours, and the status of the profession decline by the year. Teachers are under constant pressure from the authorities. The scale of this depends on the individual school: some headteachers take all the flak themselves; others pass the buck to their staff. But those who have a one-sided view of the profession as a whole are just fanning the flames, without asking themselves whether it’s an accurate assessment. Many teachers actually support the opposition, and some take part in, and even organise, protests. But only confrontational situations that get in the media – students aren’t, after all, going to make video recordings of teachers whose views they respect, so we don’t hear about them. We don’t know how many teachers tell young people: “decide for yourselves whether to protest or not” or “discuss it with your parents”. Discussions among teachers who have links to our union have shown that they have very different reactions to students going on protests: some disagree with it, others think it’s up to the young people; all of them, however, feel nervous about it. It would be strange if the profession was unanimous in its approval of youth activism, given that some of them end up under arrest and mistreated by the police. Some teenagers have already been hit on the head with truncheons: who knows what might happen the next time? Our system sees teachers as being responsible for children and young people both inside and outside school. If this were not the case, why would teachers be dismissed for posting their personal photos on social media, or schools blamed for lack of watchfulness when pupils commit suicide? Teachers are unconsciously always on the defensive, and this applies to street protests as well. We’ve put together a checklist [there is an English translation of the text below the Russian - ed.] with legal information that a teacher can give to students if they see they are determined to attend a protest. We’ve also had good feedback: most teachers said they would tell their students about it. But even if a teacher supports the idea of protests and demonstrations in principle, he or she can’t talk about it openly. On the one hand, out of concern for the young people’s safety; on the other, due to the ban on [oppositional] political campaigning in schools and strong official pressure. For officials, members of parliament and the law enforcement agencies, the idea of school students taking part in protest activity is pretty much a red alert. The system goes into automatic pilot mode: the school head has to be intimidated into nipping dissent in the bud. But headteachers and their staff are powerless in many ways: today’s children and young people have no fear of school. Many teachers have no means of influencing them: they are out of touch about opposition movements; they have no time for browsing social media and so are unable to explain coherently why they disapprove of Navalny’s rallies. What they do know is that it’s not safe (otherwise, why would the security services be on the phone?) and so they need to try to protect the pupils. And so, they do their best, to the point of hysteria, to put schoolkids of protesting. Still, neither direct pressure nor more gentle means of dissuasion have much effect on teenagers. But it’s wrong to imagine that these kids are just going on a protest “for a laugh”. It’s normal for young people to look for new experiences and do new, interesting things. So only a direct, calm conversational discussion, where the teacher makes no claim to knowing the truth, will have any effect.